Until this spring, I commuted several hours every day to and from my day job. Over the years, the offices where I worked were in downtown Portland, then Gresham, Lake Oswego and finally, Tigard. The hours driving gave me time to think. Or music. "Reading" books on CD. Voices in my head - ha. The thing about commuting is that the variable is outside of any participating driver's control. 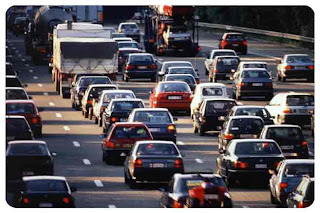 Timing can be predicted only in general terms, and anticipated heavy traffic days are sometimes, randomly, not. Or exponentially so. Planning is a veritable craps-shoot. I could map my hours, leave on time, use all my commuting tricks, and one stall on the bridge would add hours to my plan. Such is my writing at the moment. Stalled out by one element. An unanticipated glitch in my thoughtful schedule. Granted, this particular element is key to the ultimate success of the story and warrants thoughtful review and selection. But, oh, how I wish I was not stuck here. It's the work-weary return drive at a full-stop on I-5 behind a raised bridge and a diesel truck dually accompanied by the bass-boom Honda Accord with tinted windows in the next lane and the open window blast of country music from the Ford truck behind you. Here I sit. Sans country music. The good news is that being stuck does not mean inaction. Not if you want to get anywhere. The re-write of Chapter 1 in first-person has been rejected. A second re-write is in process. I know that when the traffic breaks free, it flows forward like before. As if the delay had never happened. Your writing is awesome. Just a matter of time until you find the right fit. Sure, there will be some tweaks along the way; nature of the biz.